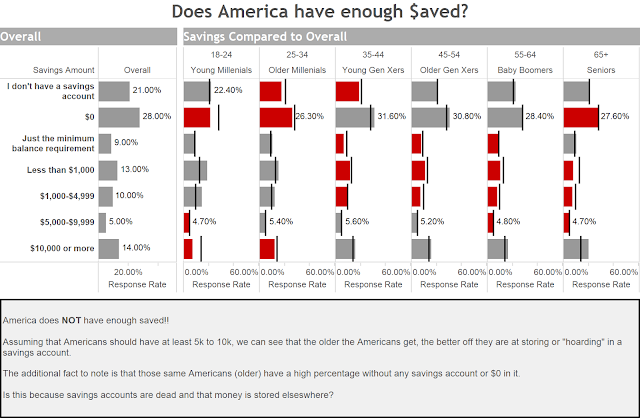 As part of VizWiz's Monday Makeover Challenge, I have put together my version on the the viz (a day late - don't judge). In this week's challenge, it was about does America save enough? Because of the limited data and the dimensions available (age group and savings amount), there was one age group that stuck out to me "Overall". I looked at this age group as the average of the all age groups. If I looked at it by comparing the overall vs each age group, I could see which is doing better versus worse. That was the "Savings Compared to Overall" section. While this looked great and I was able to put the overall reference line on it and color code as necessary if above or below "overall", I couldn't get a sense of what the "overall score is"? That is where I added the section on the left to line up and tell me what the overall American really has in savings. Finally, I annotated the findings and called out a few key points and questions to spur the consumer of the viz. I like the speculation that money may be stored in an account other than savings (IRA, Brokerage, Stocks). It would have been nice if the dataset would have included debt levels to see if there's an inverse relationship between savings and debt. Thanks for the view into savings!